Checkout how your text will look with a selection of fonts with our Font Preview tool. We can produce other fonts not listed, just contact us with your requirements. A set of four (4) cut vinyl visor stickers in your choice of colour and font (use our font preview below). This custom decal is contour cut (no background / no printing) to your own requirements. Letter height max: 8mm, length is determined by your visor and lettering (max: 110mm, Arai with brow vents max: 85mm). Unlike our lower visor decal this decal is produced without a curve so is more suited to the upper edge of the visor as well as being suited to other areas of the helmet. 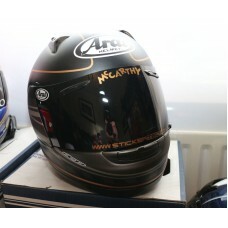 If you have an Arai with brow vents please ensure you select this correctly in our options. The standard (for others) size WILL NOT FIT between the vents. Example uses : web site address, name, nickname, team name etc. Add a flexible squeegee applicator?